The Pine Island Glacier is one of Antarctica’s largest ice streams, located south of the Hudson Mountains on West-Antarctica. It drains 5 – 10% of West-Antarctica’s ice sheets and is the continent’s fastest melting glacier. Since the 1990s, the glacier has thinned by about 1.5 meters per year and its flow into the sea has increased. 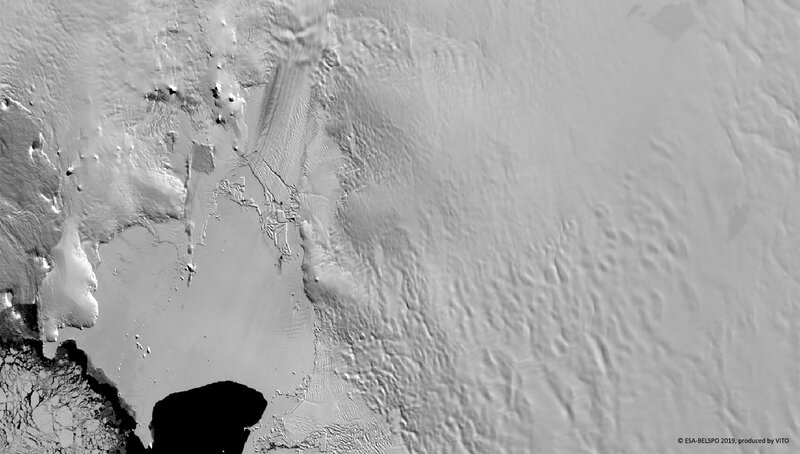 Recently, as for the previous years, a large iceberg with an area of ~300 km² calved off the glacier. As PROBA-V observes Antarctica during the austral summer, it was able to capture this calving. The 300 m image of 19 November 2018 shows the iceberg a couple of weeks after it calved off from the Pine Island Glacier. PROBA-V will observe Antarctica till the end of February 2019. All observations (November 2018 - February 2019) are made available through its dedicated data portal and the Mission Exploitation Platform (MEP) so users can play around with the data using all available tools.